Natural gas is typically harvested in environmentally destructive processes. Like other fossil fuels, burning it causes GHG emissions – less CO2/Watt than coal, but more methane/Watt. The key argument in its favor is that it&apos;s so economically viable to extract & burn it for power that its rise is currently causing the shutdown of coal mines and coal plants– thus transitioning us from a highly CO2-emissive power source to a highly CH4-emissive power source. Methane gas is a more powerful GHG than CO2, but its effects are much shorter-lived, precipitating out of the atmosphere in a decade rather than hundreds of years. 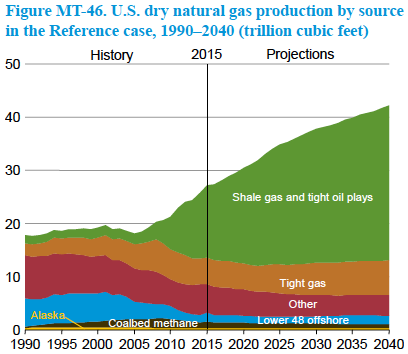 I have an article that goes into more detail on what to expect for natural gas based on the EIA&apos;s 2016 report– read it on Medium. Modern fracking takes 70-300x the amount of fluid (usually water + sand) used in traditional fracking. This fluid often becomes toxic, radioactive waste. 280 billions of this waste were created from fracking in 2012. Klein, 312 //How does it get to be radioactive? Is this true? // What are the emissions effects of using natural gas as feedstock rather than fuel?